Heavily revered for its economic importance, the Brazil nut is an agricultural favorite hailing from the Amazon. Learn more about medicinal, culinary, and cosmetic uses. Geographic distributionAmazon rainforests of Brazil, Bolivia, Colombia, Ecuador, Peru, and Venezuela. Also in tropical French Guiana, Surinam, and Guyana. The Brazil nut tree is one of the most revered and beloved trees of the Amazon rainforest, as well as a protein-rich food source to many indigenous people. 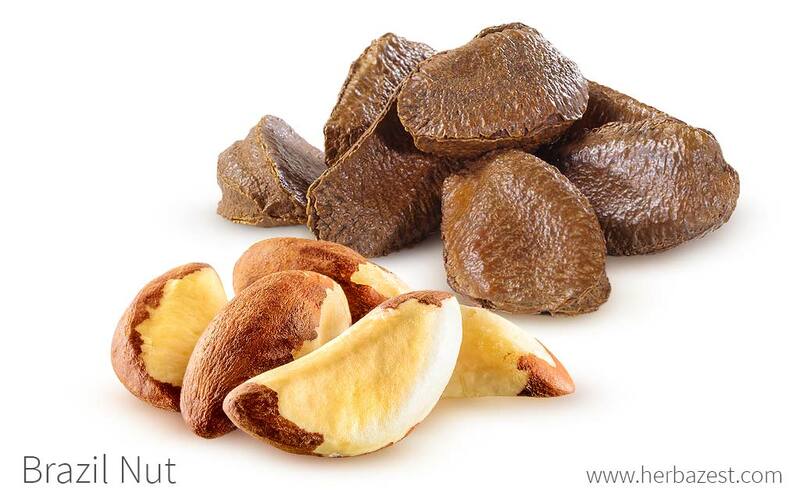 The oils extracted from the Brazil nut tree are a popular emollient, used in many skin and hair products. If managed properly, these large trees can provide income for an entire community. Keep reading to learn more about Brazil nuts benefits and nutritional value. Improving cardiovascular health. 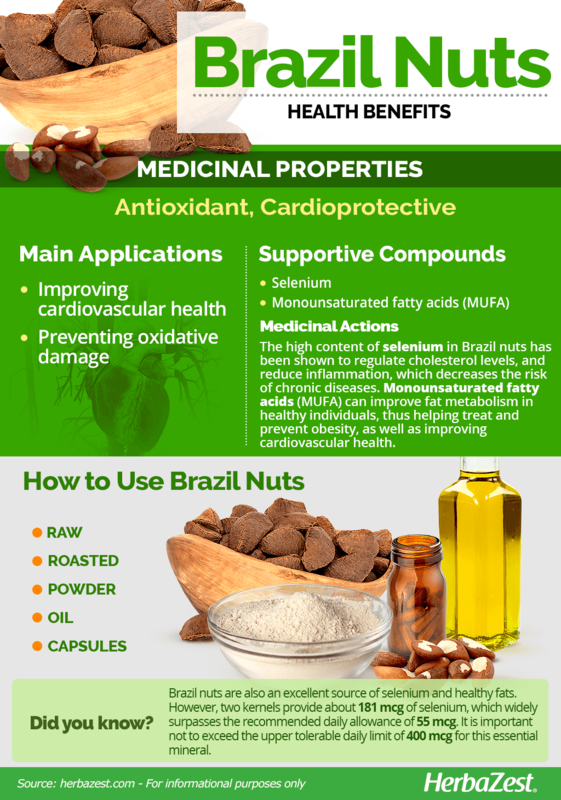 Brazil nuts help lower cholesterol levels, thus protecting against coronary artery disease. Preventing oxidative damage. These tropical nuts are powerful antioxidants, which not only enhance all body functions, but also prevent degenerative diseases. Additionally, Brazil nuts are beneficial for the endocrine system, and have been shown to prevent thyroid disorders, especially hypothyroidism. Brazil nuts are the highest natural source of selenium, which is an essential nutrient for human health and has an important antioxidant action. It has been shown to prevent cellular deterioration, inhibit the accumulation of plaque in the arteries by regulating cholesterol levels, and reduce inflammation, which in turn increases cardiovascular health and decreases the risk of chronic diseases. Additionally, Brazil nuts are rich in monounsaturated fatty acids (MUFA), and clinical trials have shown that they improve fat metabolism in healthy individuals, suggesting that the daily intake of these tasty South American nuts can play a key role in maintaining overall health, as well as in treating and preventing obesity. Moreover, it has been reported that diets high in MUFA are associated with a reduced mortality by cardiovascular disease. Studies suggest that eating as little as two Brazil nuts per day may have a beneficial effect on bad cholesterol levels. Brazil nuts are considered generally safe for daily consumption in small amounts; however, this tropical nuts are high in selenium, which can be toxic if ingested in excess. Studies have shown that the dietary overexposure to Brazil nuts' selenium increases the prevalence of chronic degenerative diseases, such as type 2 diabetes, amyotrophic lateral sclerosis (ALS), and neoplasias. It is important not to exceed the upper tolerable daily limit of 400 mcg for this essential mineral. Two kernels of Brazil nuts provide about 181 mcg of selenium, which widely surpasses the recommended daily allowance of 55 mcg. 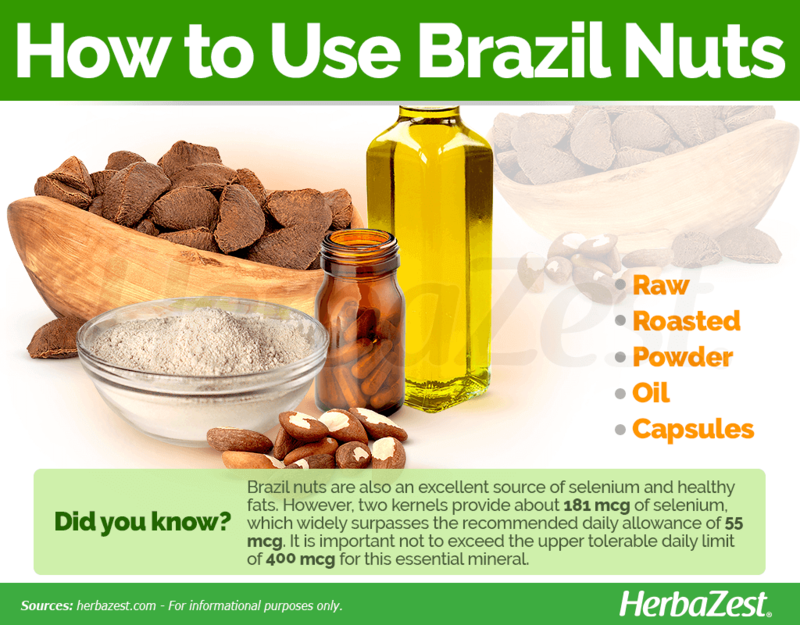 Brazil nuts are exceptionally rich in selenium, which is an essential mineral for humans. It helps the body to make antioxidant enzymes, which play a key role in preventing cell damage. Brazil nuts' selenium is also critical for reproduction, thyroid hormone metabolism, DNA synthesis, and protection from oxidative stress and infections. Studies suggest that it may help prevent certain degenerative diseases and protect the body from heavy metal poisoning, as well as from other harmful substances. Other herbs that also provide good amounts of selenium are garlic and sunflower seeds, as well as whole grains, such as brown rice and wheat. Brazil nuts are also an excellent source of healthy fats, mainly unsaturated fatty acids (MUFA), as well as magnesium and copper. 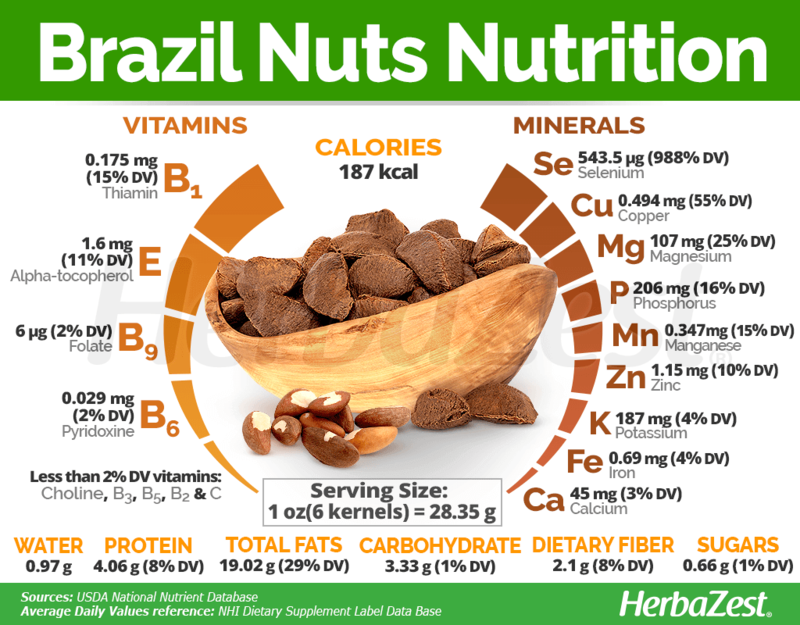 Additionally, these Amazonian nuts provide good amounts of phosphorus, zinc, and manganese, along with vitamins B1 (thiamin) and E.
An ounce of Brazil nuts (28.35 g) provides 187 calories, as well as 8% of the daily value for protein and dietary fiber, respectively. Eaten in pure nut form, Brazil nuts are a highly popular snack. They are also used in many desserts thanks to their creamy and sweet flavor. However, these tropical nuts are also processed to obtain a rich essential oil, which have both medicinal and culinary applications. Raw. A superfood on its own, Brazil nuts are usually consumed raw, as a daily snack or as a culinary ingredient, often combined with other dried fruits and nuts. However, because of their high selenium content, limiting daily intake to a minimum of two and a maximum of four Brazil nuts per day is recommended. Roasted. Another popular form of eating Brazil nuts is in roasted form. They make a great crunchy snack and can be find alone or mixed with other nuts and spices; however, it is better to avoid the ones that comes with high sodium content. Powder. Made out of raw, ground brazil nuts, this powder if rich in protein and selenium, and can be easily added to smoothies, juices, baked goods, or any other recipes. Oil. The oil obtained after cold-pressing the brazil nuts has a nutty fragrance and it is high in nutrients. It can be used in salads, as well as a moisturizer for hair and dry skin. Capsules. 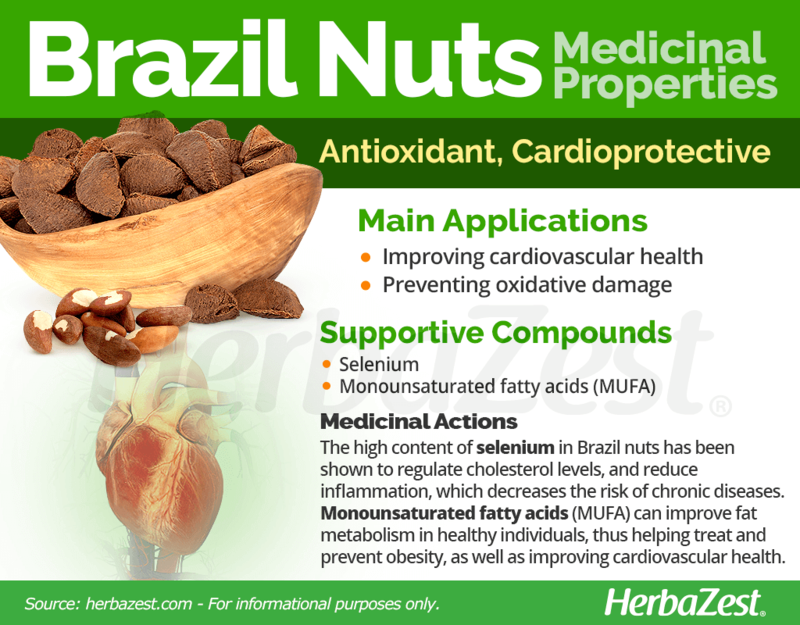 The selenium-rich oil of the brazil nuts can also be found in capsules, and as a part of other plant-based selenium supplements. Brazil nuts are widely available in most parts of the world. Whether raw or roasted, alone or mixed with other nuts and dry fruits, these tropical nuts can be purchased at most supermarkets and organic stores, as well as through online retailers. When it comes to Brazil nut powder, oil, and capsules, these forms can be easily purchased from online retailers and specialized health stores. The Brazil nut tree requires very specific conditions to grow and thrive, and it takes up to 15 years to yield its first harvest, which makes it a hard crop to start. In addition, they are only able to live in a rainforest ecosystem, in parts where it doesn't flood, and cross pollination is notoriously difficult. This is why Brazil nuts are nowadays almost exclusively harvested from wild trees growing in their native habitat, and are never used for timber – once grown, it is much more profitable to continuously harvest it, to the point where cutting or damaging Brazil nuts trees is illegal in Brazil. Standing on average 160 feet (50 m) tall and with a life expectancy exceeding 500 years old, these friendly giants produce nuts that take between 10 to 30 years to grow. The Brazil nut trees thrive in the rainforest landscape of the Amazon, and their small, green-white flowers require a very specific type of bee for pollination, the orchid bee. The Brazil nut tree is characterized by its impressive five-pound (2.25 kg) shells that contain 10 - 12 nuts arranged like an orange. The Brazil nut fruit falls to the ground at an average speed of 50 mph (80 kph). The Brazil nut tree, or Bertholletia excelsa (formerly known as B. nobilis), is a member of the Lecythidaceae family, which comprises, so far, 282 species of flowering plants across 17 genera, divided in three subfamilies: Lecythidoideae, which is exclusively neotropical and encompasses 210 species, including the Brazil nut tree; Planchonioideae, with 55 species in Africa, Madagascar, and tropical areas of Asia and Autralia; and Foetidioideae, which includes 17 recognized species in Madagascar, Mauritius and East Africa. The Brazil nut is the only species of the genus Bertholletia, whith no registered varieties or cultivars. However, well known related species in the Lecythidoideae subfamily are L. zabucajo (paradise nut) and Couroupita guianensis (cannonball tree), along with L. ollaria, L. pisonis, and L. minor, which are collectively called "monkey pot nuts." Although most Brazil nut trees grow wild in their native South America, and cultivating them in plantations has proven unsuccessful, local people gather the nuts without disturbing the delicate ecosystem of the Amazonian rainforest, and the yields are profitable enough to provide income for entire communities. Each year, a single Brazil nut tree is capable of producing 250 pounds (110 kg) of nuts. The United States imports more than nine metric tons of Brazil nuts each year. The global Brazil nut industry is worth $50 million USD annually. In Brazil, the tree is such an important economic commodity that it is illegal to cut one down. Cosmetics. The essential oil extracted from the Brazil nut has emollient, moisturizing properties, and it is a common ingredient in hair and skincare products.